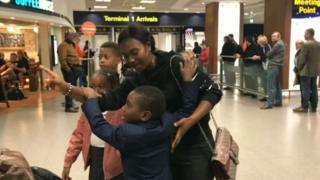 A six-year-old boy who was stranded in Belgium after he was denied permission to board a flight home has returned to the UK. Mohamed Bangoura, from Sheffield, was travelling home with a family friend on 2 September when his passport was rejected by Belgian authorities. The Home Office said the passport had been revoked as it was not valid. Mohamed was met by his mother, Hawa Keita, and other family members at Manchester Airport earlier. Speaking before the reunion, she told the BBC: "I'm so happy; I can't wait to see him." Mohamed, who had been due to start school in Sheffield, was returning from a summer holiday visiting family friends in Brussels when he was refused permission to travel. Previously, the Home Office had said Mohamed was only entitled to British citizenship through his mother or her husband, but neither was settled in the UK when he was born. On Monday evening, a government spokeswoman added: "A letter was sent to Mohamed's mother in March advising her that her son's passport had been revoked. "We understand that despite this Mohamed was taken out of the UK in July and was unable to return as he did not hold a valid passport. "Mohamed has now returned to the UK after an emergency travel document was issued allowing him to travel to the UK." Ms Keita, who is originally from Guinea, "insists she never received a registered letter by courier or by email", MEP Catherine Bearder and MP Sir Ed Davey said.